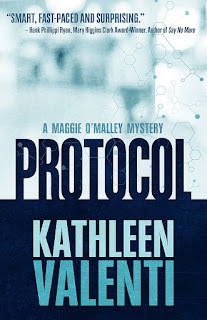 Henery Press released Protocol by Kathleen Valenti yesterday. Kathy’s main character, smart, plucky Magnolia “Maggie” O’Malley is a winner. But she gets herself into a whole lot of trouble just trying to do a good job as a pharmaceutical researcher, her first after finishing her education. She dreams of finding drugs that will cure mankind’s ills. Landing a big time job allows her to help her father’s ailing business, but not if she gets fired—or worse. I may be a sucker for a good story, but I don’t consider it a good story if the author takes liberties with the truth. So after I finished reading Protocol, I did a bit of digging related to controversies Kathleen highlighted in her book. Everything added up—she’d done her homework—and I so hoped she was wrong because it reminded me of how naïve I am and how the almighty buck rules. Kathleen Valenti’s writing makes for great fiction—unfortunately only some of what Kathleen wrote was fiction. You’ll get lost in her book, but when you finish, you’ll be horrified by the reality. You were a copywriter. What propelled you to write mystery fiction? If I’m honest? A midlife(ish) crisis. As an avid reader and former English major, I knew I wanted to write a book instead of, say, a screenplay or television pilot. I also knew I’d write in my favorite genre. Of course, the copywriter with a manuscript in her desk drawer—especially an unfinished one—is an oft-derided cliché. So I kept my novel-writing a secret from all but my family and closest friends until after the book was complete, I’d landed an agent and was close to doing the same with a publisher. I think the biggest thrill was not only proving to myself that I could write a book, but that I was writing something for me rather than a client, in my own voice rather than a brand’s. That felt pretty amazing. Your main character is a pharmaceutical researcher. Did you have a connection to that industry? How did you choose her profession and why? I decided to write about the pharmaceutical industry because I knew I wanted to have a thriller-esque mystery with big stakes. Medicine is also something that touches nearly everyone’s life (nearly three-quarters of Americans are on at least one prescription drug), which gives it incredible power. This combination of omnipresence and power creates some interesting possibilities for a mystery. I don’t have a personal connection to this industry, but I have a friend who works for a big pharmaceutical. This friend has become an indispensible resource, for which I am forever grateful. As for Maggie’s profession, her role as a researcher not only reflects her personal history and professional desire to better the world, but also sets her up to save lives outside the lab. Where was the setting of your story and why did you choose that location? I chose to create a fictional Midwestern city in which to set Protocol. I love reading books with real-life locales but wanted complete control over my virtual surroundings. Inventing a city to go with everything else that I had invented allowed me to do just that. How did a young Maggie deal with her mother’s death? Maggie is a master of sublimation. She channeled the pain of losing her mother to cancer into a mission to help others avoid the same fate. By losing herself first in school then in work, she lost the ability to effectively deal with negative emotions. Unfortunately, life begins doling out circumstances that inspire those emotions, forcing Maggie to face the possibility that she can’t control everything—including how she feels. Maggie’s problems start with a used cell phone her best friend Gus gives her. Meeting reminders show up on her phone that she didn’t make. He thinks the company that sold him the used phone didn’t wipe the previous owner’s data completely. Why is this a problem? A previously owned phone that doesn’t have all of its data wiped means that whoever has that phone can access the previous owner’s data: photos, phone numbers, emails and texts. It also means that it can continue to connect to other devices, like computers and tablets, leaving a door through which bad things—and people—can enter. Maggie drives a 1962 Studebaker. Did someone in your family have one? Yes! 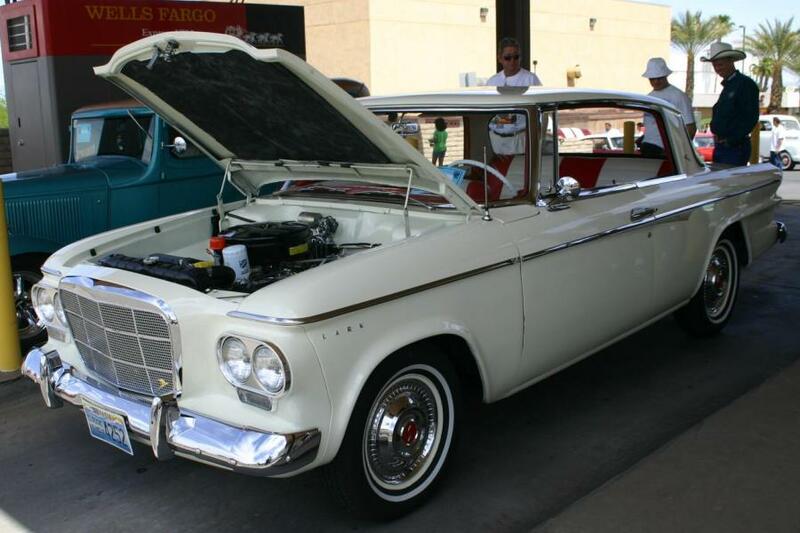 We have a 1962 Studebaker Lark. My dad has owned a slew of them over the years and gave us one in great need of repair to restore. I have many memories of tooling down the highway in the Studebaker, getting thumbs-ups (and strange looks) from other drivers. Incidentally, in the final version of the book, I changed Maggie’s Stude to a 1960, which was the year her car’s paint and upholstery combination was available. Sure, I could have changed the car’s color scheme, but it matched one of my dad’s old cars, so it stayed for sentimental reasons. Maggie beat out 140 applicants to land the job at Rxcellance. What happened to Maggie in the first few weeks of the job that lauded her as a new employee star? Maggie is hardworking, innovative and creative. In her early weeks on the job, she made a breakthrough on an acne drug she was developing and received an industry award from her work as a grad student. Not too shabby for a newbie! Does it really cost pharmaceutical companies about $800 million to bring a new drug onto the market? There’s been a LOT of conversation about the million (or near-billion) dollar pill. That 800 million dollar price tag was made famous by a 2001 Tufts Center for the Study of Drug Development, which estimated the cost of developing new drugs at $802 million. In 2014, they said that cost had risen to nearly $2.6 billion. These numbers are controversial—and varied, depending on who’s disseminating the information— because R&D costs are not usually made public, some feel the study contained assumptions that favored the pharmaceutical industry, and because drug companies can use these numbers to justify the prices of their drugs. It’s a complicated picture, but one thing’s for sure: it’s big business with big profit margins. What are test protocols and is the FDA involved? In a nutshell, a clinical trial protocol for pharmaceuticals is designed to keep participants safe and to answer specific questions about a given drug under development. The protocol describes the who/what/where/when of the study, such as who can participate, the schedule of medications, dosages and procedures, the length of the study, etc. The Food and Drug Administration (FDA) has oversight in clinical investigations to protect the rights, welfare and safety of subjects. It’s when a company or group of investors promotes (pumps up) a stock then sells (or dumps) it after it’s ridden the crest of interest to high value. It’s all about shifting supply and demand, and is usually generated through hot tips on the next big thing—which, as it turns out, isn’t big at all. It’s illegal, but unfortunately not all that unusual, especially on small stocks. File this one under If It Sounds Too Good to Be True. You present a counterpoint POV in Charlene. Did you want her voice heard? In the early drafts of Protocol, Charlene was the first voice the reader heard. Although she appears on fewer than a dozen pages, she’s absolutely pivotal to not only the plot, but to the book’s central theme about the illness of poverty. Her plight is emblematic of a larger problem that’s in plain sight yet often hidden from our consciousness. Is this a standalone or the beginning of a series? This book was originally written as a standalone. My publisher liked the characters so much they wanted to make it a series. Because I was in love with the people I created, I was absolutely delighted to do so. 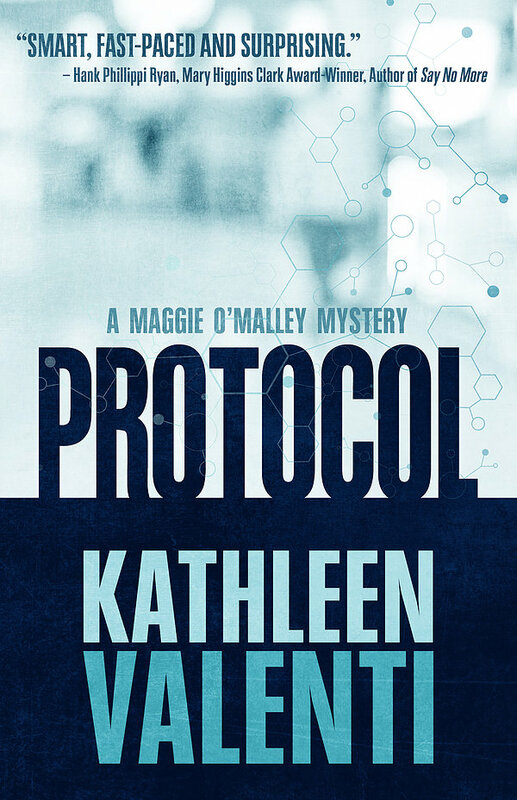 Protocol is book number one. I’ve just begun the third book in the Maggie O’Malley series. I love that I’ve become such good friends with my characters. I can’t wait to see where they lead me next! Are you a beach or a mountain person, Kathleen? I live in what could be considered a ski town, less than an hour from not just one mountain but a whole range. I’m a mountain girl all the way! Thank you so much, Margaret!! This sounds absolutely fascinating. I live in a town near pharmaceutical giant Pfizer, so people here pay attention to that industry. And I adore your Lark! One of my favorite memories was tooling around in my best friend's 1961 (I think) DeSoto - complete with the fins. That thing drove like a boat! I like novels that introduce me to new worlds! Especially if they are worlds that really exist and I just haven't been exposed to them. Something else for my TBR list. Your book sounds intriguing. I'm concerned that the ethics of the pharmaceutical industry are suspect. I think things get even worse when we look closely at generic drugs. When I looked at the bottle of a generic drug that I take, I was astounded to discover printed on the label (that would have been covered by the sticker with my name, etc.) read, "Made in India. Wishing you lots of luck with this series. This is a great subject and so appropriate for a scary thriller! Under The Grass Is Greener, I've always greatly admired copywriters. I LOVE the Studebaker. My dad had Hudsons, so I grew up loving--and driving--very old cars. Thanks for the interview, Elaine and Kathy! Thanks so much, Kaye! Your kind words about copywriters made my day! It's a fun and crazy profession. One day I'm writing about a resort or a computer app, the next, it's disc brakes. Never a dull moment. :) Writing on a deadline has definitely come in handy in the book world. A Hudson!! My dad would've loved that! So unique--and rare.